First Round : Jim McGovern, with a seven-under par 65, led by one over Mark O'Meara and Greg Norman. Second Round : Robert Gamez and Ben Crenshaw, at nine-under par 135, led by one over five players. Third Round : Norman, at 13-under par 203, led by one over Gamez and two over David Duval and David Frost. Missed Cut: John Adams (73-74-MC), Billy Andrade (75-77-MC), Paul Azinger (76-74-MC), Dave Barr (77-71-MC), Guy Boros (71-80-MC), Brandel Chamblee (73-73-MC), John Cook (70-77-MC), Glen Day (74-78-MC), Mike Donald (73-78-MC), Rick Fehr (73-75-MC), John Harris (75-72-MC), Gary Hallberg (75-73-MC), Mike Heinen (73-73-MC), Brian Henninger (76-75-MC), John Huston (74-76-MC), Brandt Jobe (78-72-MC), Greg Kraft (74-73-MC), Neal Lancaster (78-78-MC), Justin Leonard (73-75-MC), Andrew Magee (74-72-MC), Jeff Maggert (73-73-MC), Roger Maltbie (71-75-MC), Billy Mayfair (72-74-MC), Mark McNulty (73-77-MC), Larry Nelson (74-77-MC), Jack Nicklaus (78-75-MC), Andy North (77-77-MC), Joe Ozaki (72-75-MC), Steve Pate (73-74-MC), Corey Pavin (75-72-MC), Dicky Pride (76-78-MC), Eduardo Romero (75-72-MC), Charlie Rymer (74-72-MC), Mike Springer (72-78-MC), Kirk Triplett (73-75-MC), Ian Baker-Finch (84-WD), Chris Perry (72-WD). Weather: Play was suspended on Thursday at 8:35 a.m. due to rain and lightening with 16 players on the course. Morning play was canceled and the round was re-started at 1 p.m. going off two tees with lift, clean and place rules. Play was suspended for the day at 8:30 p.m. with 55 players still on the course. The first round was completed on Friday morning with play beginning at 8 a.m. The second round followed immediately after. Saturday’s third round was suspended due to dangerous weather conditions at 12:40 p.m. and was resumed at 4:50 p.m. Play was suspended for the day at 8:20 p.m. with 22 players still on the course. The third round was completed on Sunday morning beginning at 8:20 a.m. with the final round starting at 11:10 on both tees. Maybe the secret to Greg Norman's success at the 1995 Memorial Tournament lies in something most professional golfers don't often practice - the art of relaxation. In an era of increased international competition and a year-round tournament calendar, time for rest has almost become a thing of the past for the typical PGA TOUR golfer. But early in the 1995 season, the anything-but-typical Norman decided, due to back spasms and a full 1994 schedule which saw him earn over $1.3 million, to take some time off. What was originally supposed to be a short vacation turned into an extended one- five weeks away from golf . . . completely away. "I didn't swing a club or hit a ball," remembered Norman. So with Norman arriving at Muirfield Village Golf Club unmistakably refreshed, the 20th Memorial Tournament provided the perfect setting for a timely shark attack. En route to his second Memorial title, Norman dominated one of the PGA TOUR's toughest fields, as well as one of it's most challenging golf courses, with a 19-under-par 269 performance (one shy of the tournament record) and a four stroke victory over Mark Calcavecchia, David Duval and fellow Aussie Steve Elkington. "It's not easy to not touch a club for five weeks and then come out here and blow everybody away," said Calcavecchia, who led briefly on the front nine Sunday. "It kind of shows you just how good he (Norman) is." Elkington would not question Norman's ability, but he doubted, with tongue planted firmly in cheek, Norman's recollection of exactly what he did and didn't do during his time away from TOUR. "Greg might not be telling the truth," Elkington said with a grin, "he might've been at home practicing." On Sunday afternoon, with pressure being applied first by Calcavecchia and later by Elkington, the Great White Shark ruled the waters. Norman birdied three of the last five holes. He one-putted six of the last seven greens. He made two critical par saves at 15 and 16 and followed them with title clinching birdies at 17 and 18. In the end, Norman had shot a headstrong, dogged six-under 66, coolly tipped his trademark wide-brimmed hat and won going away. After earning his first Memorial victory in 1990 when he was the third round leader and rain forced the cancellation of the final round, Norman felt he had something left to prove at Muirfield Village Golf Club. "The second one tastes better," said Norman. "I never had a chance to go out there on Sunday and finish it off the first time. I always wanted to come back and win over 72 holes." Just as play teed off Thursday morning, so too began a steady rain. 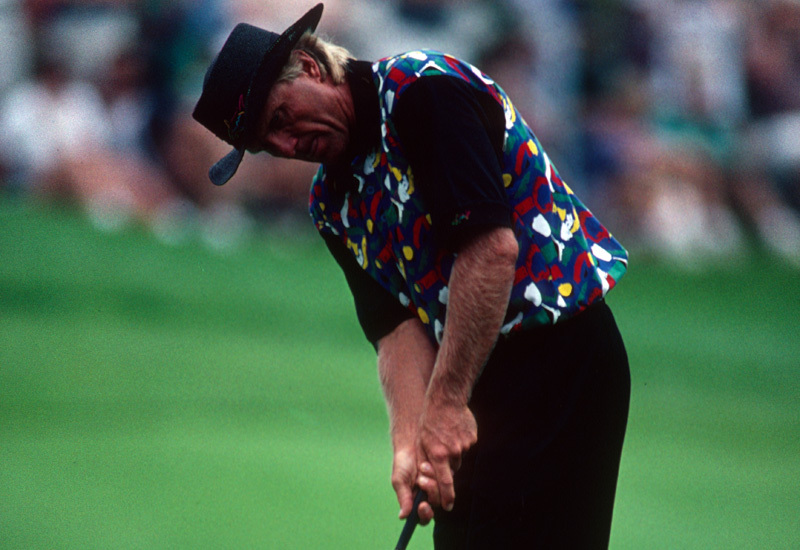 In fact, the 1995 Memorial was barely an hour old when play was halted with just 14 players on the course. After about a three hour rain delay, PGA TOUR officials decided to wipe the slate clean and start the whole thing over, this time using two tees and declaring lift, clean and place rules would be in effect for the remainder of the tournament. For 55 players, Thursdays round spilled into Friday morning. Jim McGovern, himself among Friday's early risers, returned to take advantage of the softened conditions in playing the last seven holes four-under par and emerging as the first round leader with a seven-under 65. Norman and Mark O'Meara trailed by one. By nightfall Friday, after another wet twelve hour work day that ended with 1995 Masters champion Ben Crenshaw and Robert Gamez sharing the 36-hole lead at nine-under 135, the tournament was back on schedule. Norman still trailed by a shot, and his confidence began to build heading into the week-end's play. "I felt fire in my belly today," said Norman as darkness fell over Dublin Friday evening. "When you are in the lead or near the lead with all the great players like we have here, it's a great feeling. Now we can get down to the nitty gritty." Unfortunately for Norman and his opponents, Mother Nature would suspend Saturday's version of the "nitty gritty." Yet another weather delay left 22 players unfinished at the close of business on Saturday. Consequently, by the time Norman had wrapped up his third round by returning to play four holes Sunday morning, his steady 66-70-67=203 afforded him a one-stroke advantage heading into the afternoon's final round. Norman's one-shot lead, however, quickly became a one-shot deficit when Mark Calcavecchia sprang a birdie-birdie-birdie-eagle spree on holes 4 through 7. But while Calcavecchia spent the rest of the day continually cooling, Norman would fluctuate between simmering and boiling. A birdie by Norman on the par-five seventh brought he and Calcavecchia even; another at eleven and Norman was once again the leader. Maintaining that lead took some heroics, most notably a half-buried pitch from the high grass on purgatory hill behind the 12th green that nearly dropped in the cup. From the same posi-tion moments earlier, Vijay Singh flew it first onto, then over the green and into the bordering lake. Norman's shot landed precisely where it had to and ended up exactly where he wanted it-almost. "That shot was a 9-1/2 - it would have been a 10 if it had gone in," said Norman. Then, while Elkington was busy sneaking to within a stroke of Norman by birdieing both 15 and 16, the Shark was pulling his tee shot on the delicate par-five 15th into the left rough. When his recovery shot pitched through the fairway into the right rough, Norman found himself staring at two trees 24-feet directly in front of him with only a five foot gap in between. Most players would have seriously considered a safe chip out to the fairway and played for a lengthy up-and-down par, but not Norman. "To me there was no option," he said describing the shot which set up a chip to five feet and par saving putt. "I never thought about chipping out." Following another up-and-down par from off the green at 16, Norman had one thing on his mind - closure. "I said to myself walking to 17, 'Let's birdie the last two and get this thing over and done with,'" said Norman. "I wanted to win this tournament badly." Norman's birdie-birdie closing was the grand-finale, his full-speed-ahead victory lap for his second Memorial conquest. Norman joined tournament founder Jack Nicklaus (1977, 1984) and Hale Irwin (1983, 1985) as the only two-time winners of the Memorial Tournament.